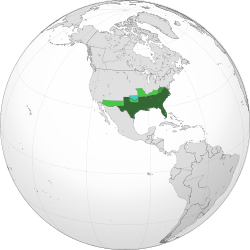 The Confederate States in 1862 in dark green. Light green denotes claims made by the Confederacy. Medium green denotes western counties of Virginia that separated from that State and were admitted to the Union as West Virginia. Teal denotes the still contested Indian Territory. ↑ "Preventing Diplomatic Recognition of the Confederacy, 1861–65". U.S. Department of State. मूल से August 28, 2013 को पुरालेखित.